Photo by Chad Plauche-Adkins The fire hydrant near the County Home was painted by Marion Maxon for his Eagle Scout project. Photo courtesy of Linda Maxon Marion Maxon received his Eagle Scout badge on Sunday in Marietta. MARIETTA — Video games, eating pizza and chatting with friends on Instagram can dominate a lot of free time for teenagers. But for Marion Maxon, a 15-year-old sophomore at Marietta High School and member of Boy Scout Troop 200, his schedule has been filled with spending time helping others. On Sunday, his efforts were recognized by the scouts when he was awarded his Eagle Scout badge. Maxon said his journey with the scouts started six years ago. “I heard (the scouts) did campouts and a lot of outside activities, so I decided to find out more about them,” he said. Maxon said the meeting the criteria to become an Eagle Scout was a daunting and rewarding process. “You have to be a Senior Patrol Leader, get 21 certified merit badges, 11 Eagle Scout badges and do your Eagle Scout project,” he said. After becoming Patrol Leader and collecting the required badges, Maxon said he looked for ideas for his project. According to the Boy Scouts of America’s website, the scout must plan, develop, and give leadership to others in a service project helpful to any religious institution, any school or their community. With the help of the Reno Volunteer Fire Department, Maxon found the project that would satisfy the scout’s needs. Maxon started the project by himself, but he said he soon realized it was too large of a task for one person. “I knew it couldn’t get done by myself,” he said. With the help of 15 of his fellow troop members, Maxon said he was finally able to tackle the project in earnest. But he said the painting still took longer than expected. “It took three months to finish,” he said. 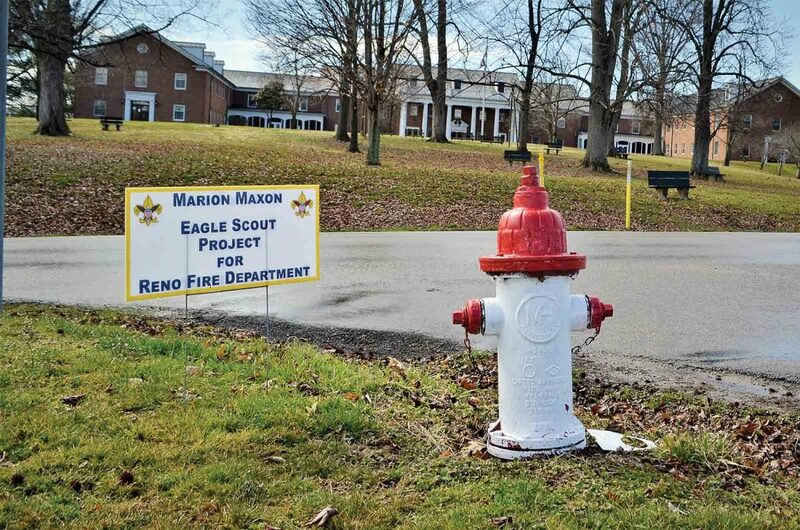 Todd Meeks, the assistant fire chief at the Reno VFD and the assistant scout master for Troop 200, said he worked with Maxon on planning and implementing the hydrant project. “It was something that needed to be done,” he said. Meeks said painting the hydrants helped with both the integrity and aesthetic appeal of the fireplugs. Meeks said he has known Maxon since he was an infant, and attributes his character to his family’s support. “His mom and grandma are very active in his life,” he said. Maxon’s grandmother, Linda Maxon, said her grandson has had to persevere in order to achieve the highest honor in Boy Scouts. 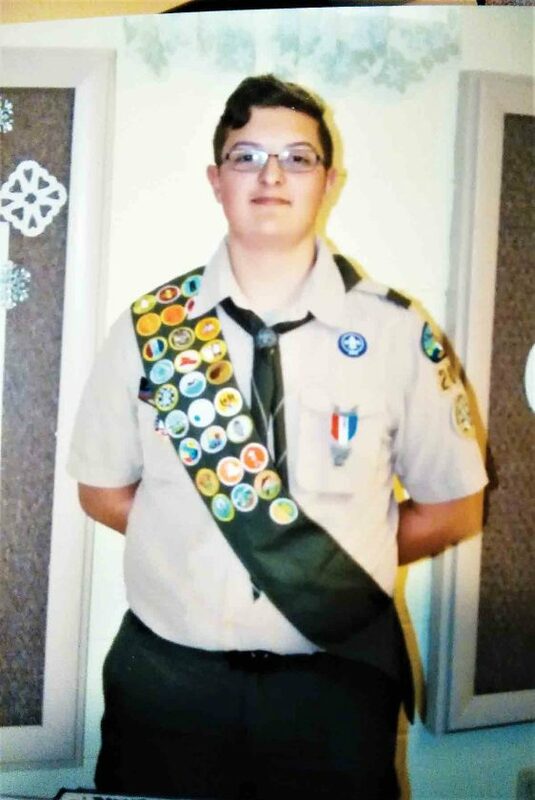 Maxon said even though he has already earned the title of Eagle Scout, he wants to contribute his experiences achieving the rank to the rest of his troop and live by the standards taught to him by the scouts. “I want to help other boys achieve their Eagle Scout…and represent the scout oath in my everyday life,” he said.